As an executive coach in Nebraska's largest privately held company, my day is spent in back-to-back one-on-one sessions with managers. Although I would never call it cold reading (at least not out loud in a corporate environment), I consistently use the principles of cold reading to help a client get comfortable in opening up to me as we work together on their professional development. 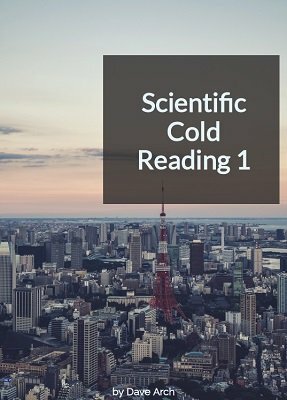 This first in a series of scientific cold reading documents and videos explains the scientifically accepted and proven model I've used for decades to accelerate the process of getting to know someone and grow their confidence that I am able to help them advance in their career. As I share with my clients insights about the personality traits I sense about them (that they didn't need to tell me), they begin to feel like I already know them and consequently become increasingly comfortable sharing with me other personal facts that I couldn't possibly know. In my experience, that's what effective cold reading has the power to deliver. 1st edition 2018, PDF 6 pages, video 11 min.